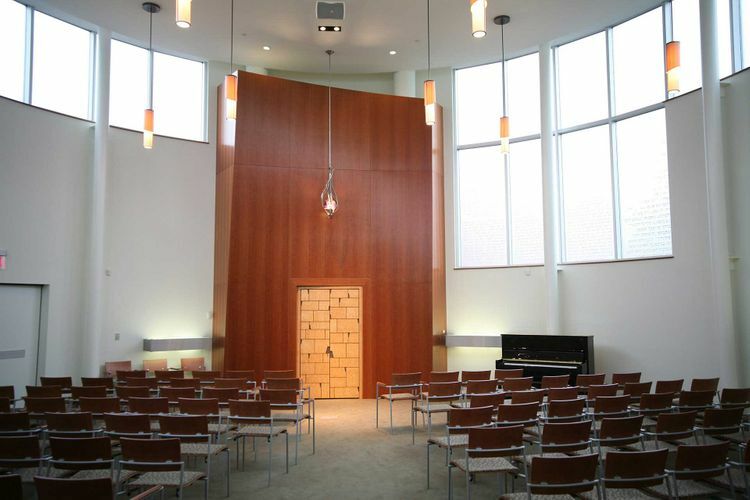 General Contractor: Studio Techne Inc.
Temple Emanu El is a very unique structure, designed and built with purpose and tradition in mind, a collaborative venture of a very democratic and involved congregation. The new $7 million temple constitutes a 34,000sf structure situated on a complex 11 acre piece of property snuggled into a residential area – and it actually fits. The 61 year old congregation first decided to relocate in January 2005. It was not an easy feat to gather all the memories, traditions and emotions and transfer them, but for the most part this resilient, ambitious and innovative congregation was able to accomplish just that. The campus of the new synagogue includes a sanctuary that seats 260, an intimate chapel that seats 100, ten classrooms, a teen center, a library/media center, a multipurpose room, a social hall that seats 375, a well-designed multi-function atrium, a boardroom, efficient office space, a commercial kitchen, a music room, outdoor playgrounds, a patio and gardens. OCP was involved in the third, most exciting phase of construction – the completion of the interior and exterior building finishes. They joined the team with The Albert M. Higley Co. and were glad to have prior working experience with The Albert M. Higley Co. and other members of the team that helped work flow smoothly and allowed questions to be answered quickly. 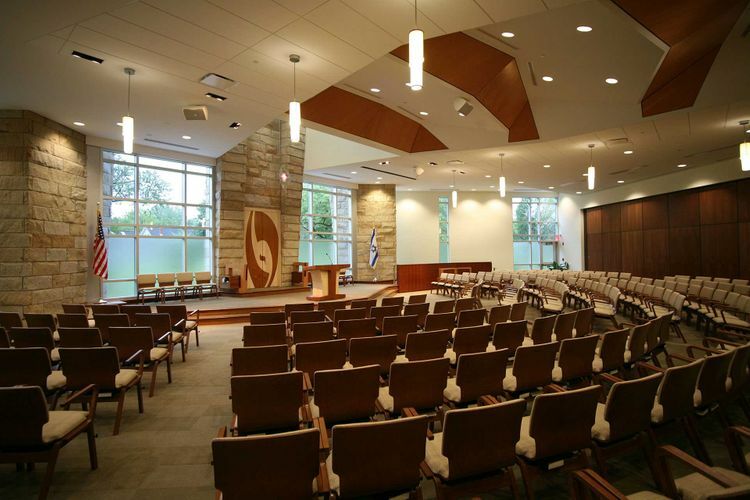 Although there were no major obstacles in regard to schedule, major design changes, especially in the sanctuary required OCP to be flexible, work quickly while maintaining high quality and collaborate with other trades to get the job finished on time. There was also the usual push common for Ohio weather to get the building enclosed and exterior work completed before winter. OCP was able to deliver without a lot of extra effort because following a schedule to please a customer and complete a successful project is standard procedure. This project was extremely unique when it came to customer satisfaction. 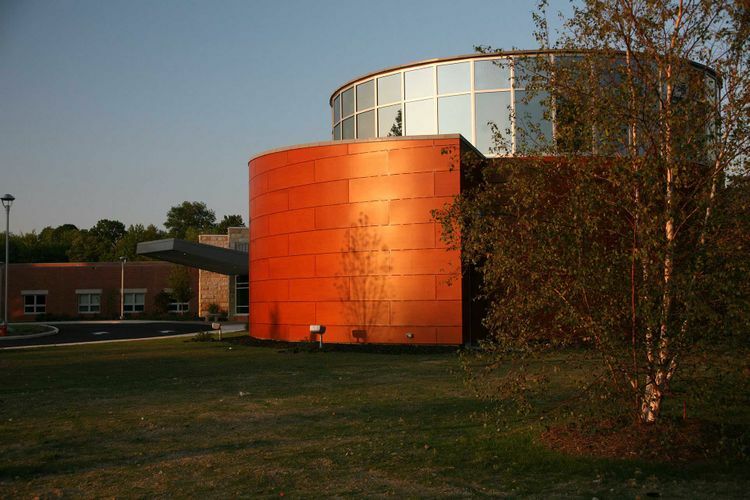 The Rabbi and members of the congregation were very involved in the design and building of this project. From the beginning, even in the decision to relocate, committees were formed and used in every decision making process. Design firms were researched, compared and interviewed in great detail. The congregation felt confident in their decision to hire studioTECHNE from the very start to the completion of the project. studioTECHNE was credited with great integrated design, well suited for the placement and purpose of the Temple. They thoroughly researched, clarified and discussed the needs of the project and the unique requirements of building a synagogue. Although Jewish culture and preferences played a major part in the construction, the congregation decided to observe some Jewish traditions of building a temple while discarding others. Working for a customer that has such a wide array of input has both pros and cons. First, it is helpful to have numerous ideas flowing and great designs spawned from these ideas. Second, having numerous people involved means a lot of people to please. Fortunately, the members that were selected worked in harmony as a unanimous group. They were demanding, but just enough to drive a successful project. The team that was chosen for the construction of the project was able to work with the congregation and design team and deliver an outcome that pleased everyone involved. Other than meeting the challenge of high expectations, there were also numerous challenges involved in the actual construction of the temple. 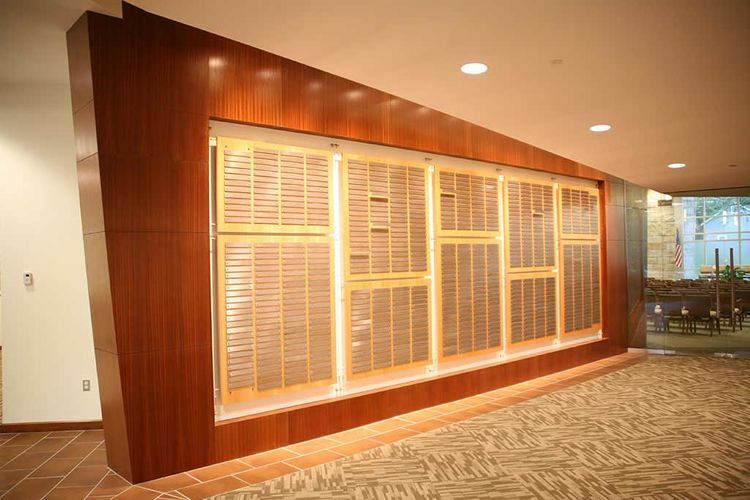 Within OCP’s work scope, the millwork proved to be the biggest challenge. 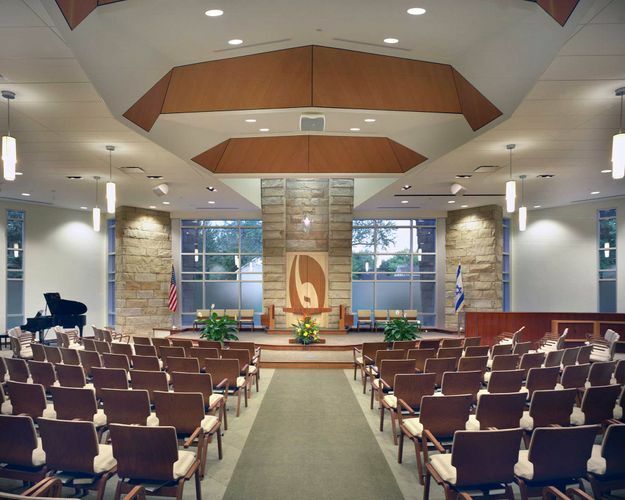 Major elements included the Yahrzeit (memorial) wall, panels in the sanctuary, cabinetry and a custom designed ark in the chapel which is used to house the scrolls of the law (Torah). The use of wood for all these elements helped to promote the warmth and natural air of the temple which was the basis of its design. Wood panels with an epoxy resin were used in the chapel and also in the ceiling of the sanctuary. The natural wood look continues outside with exterior wood paneling enveloping the exterior of the chapel. The exterior wood serves two purposes – honoring the Jewish tradition of a synagogue being hidden from sight and also shading the glass of the chapel that is etched with passages from the Torah and Rabbinic Texts. Although the original design of the temple had some extraordinarily designed features, some of them had to be subdued for reasons of feasibility. For example, the wood panels in the sanctuary were originally designed to be translucent panels with lights above them. OCP attempted to work with the design, but came up against insurmountable code violations and turned instead to the Douglas Fir wood veneer paneling with reveals and drywall trims. The main frustration of this was several months time lost before the reality was agreed upon, the entire re-design of the ceiling completed and construction of the existing ceiling was able to continue. The custom designed ark cabinet formed to the radius wall of the chapel was another dramatic challenge. The ark has an oscillating-like effect, further enhancing the difficulty of following the radius of the wall. The depth of the cabinet grows as height increases. The difficulty of this design intent was also complicated by doors larger than any hardware could handle. The door design was changed after communicating the impediment to the owner and architect. Once again, the change in design was functional and did not disrupt the flow of the design elements. Millwork as mentioned above was the most remarkable feature of OCP’s work scope on this project. Custom designs led to the complexity of the numerous wood features, but OCP was well capable of performing to the desired level of quality. Numerous soffits, radius walls, reveals and drywall trims throughout the structure also allowed OCP to showcase their craftsmanship. The exterior wood paneling also required superior craftsmanship. Another important aspect of OCP’s workforce is that they were able to complete the entire project without a single safety incident. Safety is of great importance on all projects and no project is successful without this safety record. The exterior wood paneling proved to be a challenging material to manipulate. OCP was able to meet the challenge of following the curvature of the building by keeping all panels level, with required spacing. The panels were cut to width and then attached to the radius structure with stainless steel screws with matching colored heads in specified locations as well as a natural stainless screw head to create a pop rivet appearance. The overall appearance is remarkable and the design well fits its purpose. Innovations in both techniques and materials were used when OCP recognized code violations and persuaded the owner and designer of particular changes in the sanctuary ceiling design. Although the changes were frustrating, especially when holding up work, the end result was pleasing to both the owner and to OCP. Fortunately the changes did not interfere with the natural flow of the temple’s design, but actually enhanced it. 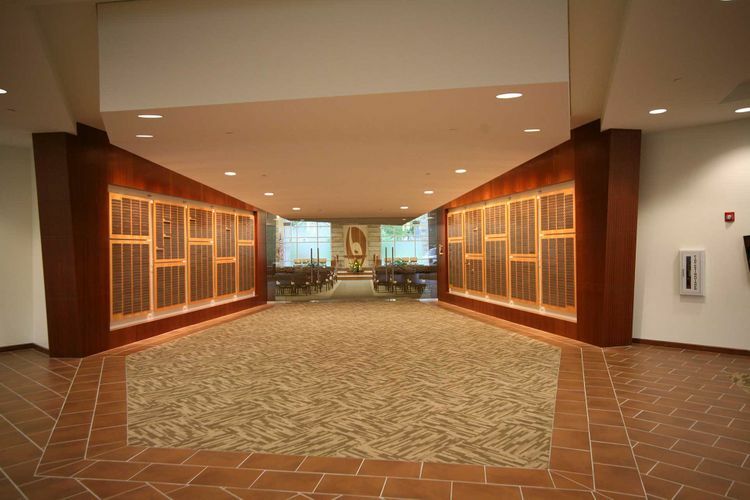 The Temple Emanu El project was an overall success, measured by timeliness, cost effectiveness, safety record and customer satisfaction. The overall design was fitting to the requirements of the project, the team chosen to construct the project was able to work together as seamlessly as the originators and the end result was as magnificent as the high expectations that created it. OCP Contractors is proud to have taken part in such a successful project.